Think you know about poetry readings? Wake. Write. Walk. Hurry. Hug. Cook. Sleep. A June prescription good for no one. Yet that was mine of late, until I remembered. I am the daughter of Marion and Alex, original big gulp of lifers, jaywalking with cane and careful steps slicing across Bloor Street—even as I protest wait, be careful!— eager as they are, as I am, for what’s ahead. We were there to hear the Griffin Poetry Shortlist winners read from their nominated books. This is easily one of the perfect nights of early summer. Koerner Hall is an architectural and acoustic wonder. In the seats are writers-emerging, aspiring, renowned alike— publishers (yes, they exist-still), readers, hipsters, and wanderers, hoping to clear the circus of Toronto away to breathe in something new. The nominees have ten minutes each to read and wow us. 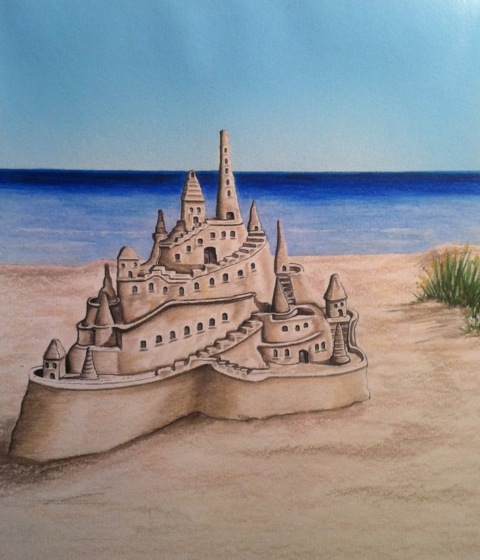 One poet suggested the air in the room was just ordinary air until the poets spoke and then, it became extraordinary, fortified now with poetry. Inhale deeply. Forget your lists and mayhem. Instead, discover. Sue Goyette’s book Ocean is now on my bedside table, reminding me of that night of goosebumps. The Nova Scotia poet didn’t win the big prize the next day, but her work is miraculous yet. 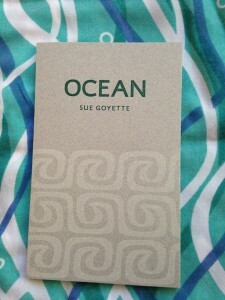 In a series of connected poems, Goyette has explored our relationship with the ocean in a funny and poignant voice, rich with innovation and craft. Titled ONE through FIFTY-SIX, Goyette’s book, from Gaspereau Press, is the kind of work that shakes everything you’ve read before about the ocean, epic tomes and salutations pushed aside. Here is a sample. See why I am now spellbound and counting the days (50 more sleeps) until I get my own feet wet again. promises, the baked dreams into its mouth. was thinking we were making it happy.